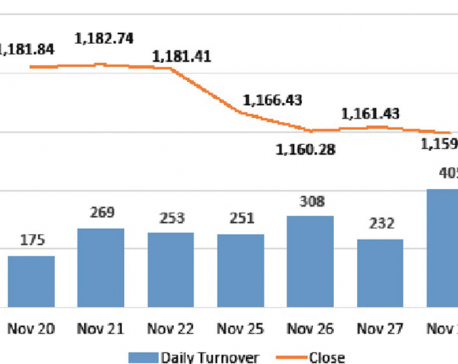 KATHMANDU: The sole securities market of Nepal witnessed weakness throughout the trading period on the week’s first day. The Nepal Stock Exchange (Nepse) index, which fell sharply in the beginning hours, consolidated slightly mid-session. Nonetheless, stocks failed to recover the day’s losses, shedding 14.73 points to close at 1,226.38 points on Sunday. 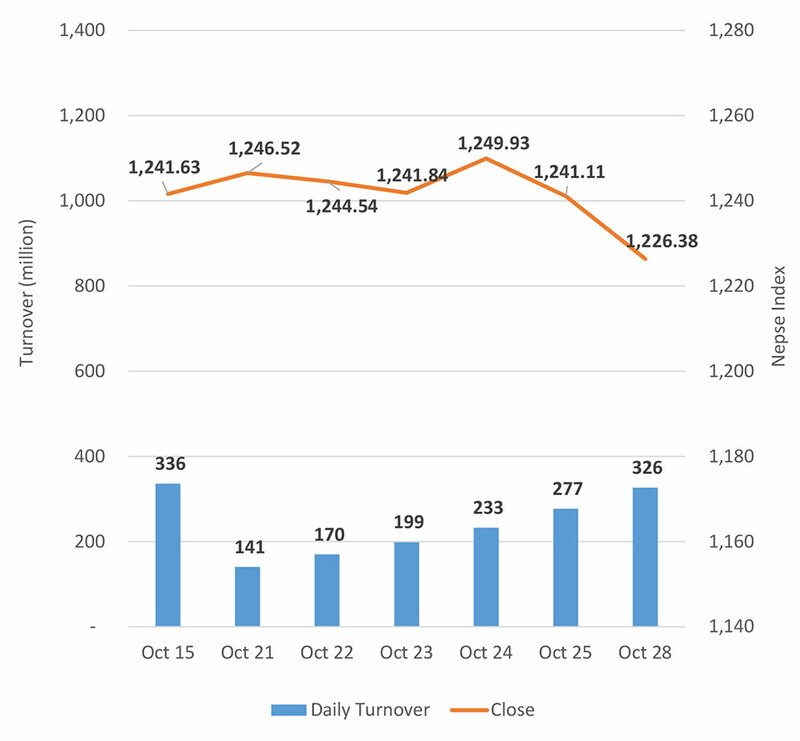 The index, which traded range bound in the last week, dropped significantly on the day. 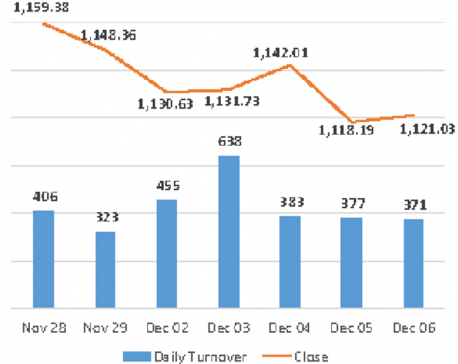 Despite Nepse’s decline, market participation improved by over 18 percent to Rs 326 million. A decline in banking stocks pushed the benchmark index lower on Sunday. Banking sub-index fell by over 1.44 percent on the day. All other sub-indices, barring the Hotels sub-index, closed the day lower. Non-life Insurance, Finance and Microfinance scrips struggled, posting a decline of more than 1 percent each. Besides, Life Insurance sub-index sank 0.75 percent, while sub-indices of Development Bank and Hydropower segments shed 0.68 percent each. Market participation was led by Global IME Bank Ltd and Prabhu Bank Ltd, posting turnovers of over Rs 23 million each. Similarly, more than Rs 22 million worth of shares of NIC Asia Bank Ltd changed hands on Sunday. Furthermore, Janata Bank Nepal Ltd registered turnover of over Rs 18 million. Shares of Mega Bank Ltd, NMB Bank Ltd and Kumari Bank Ltd were also actively traded on the day. Nepal Seva Laghubitta Bittiya Sanstha Ltd led the list of advances as the micro lender’s share price increased by almost 6 percent. Secondly, share price of Rairang Hydropower Development Company Ltd jumped 4.96 percent. Unnati Microfinance Bittiya Sanstha also added 3.62 percent on its share price. Further, share prices of Barun Hydropower Company Ltd and Best Finance Company Ltd appreciated by over 2 percent each. On the contrary, IME General Insurance Company Ltd was the biggest drag on Sunday with its share price tumbling over 5 percent. United Finance Ltd pared its gains from the previous week with a loss of almost 5 percent on its share price. Meanwhile, Guheshwari Merchant Bank & Finance Co Ltd and Api Power Company Ltd fell over 4 percent each. Other top losing stocks include Reliance Finance Ltd, Nagbeli Laghubitta Bikas Bank Ltd and Ridi Hydropower Development Company Ltd.
On the earnings front, Progressive Finance Ltd published its financial statement for the first quarter of Fiscal Year 2018/19, reporting a net profit of over Rs 17 million. The finance company had posted a loss of over Rs 10 million in the corresponding quarter of the previous fiscal year. Similarly, Infinity Microfinance Bittiya Sanstha Ltd has reported a net profit of over Rs 6 million. The microfinance institution is preparing to launch an Initial Public Offering (IPO) to raise Rs 60 million from general public. As per the ARKS technical analysis, the market posted significant loss on the day with the formation of a bearish candlestick. Technical indicators also suggest the momentum favoring bears at present. Further downfall might see the index hit the support of around 1,215-point mark.